This old traditional English favourite needs good soil to do well and crops are more modest than some but it’s well worth growing. 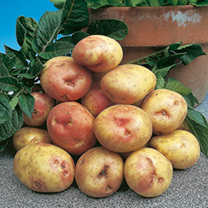 Long growing season.Boil, steam, mash, chip, saute, bake or roast. Maincrop variety.